﻿ Investigations into <i>Amanita ovoidea</i> (Bull.) Link. : Edible or Poisonous? Investigations into Amanita ovoidea (Bull.) Link. : Edible or Poisonous? It is widely known that the genus Amanita includes various taxa: edible and inedible, dangerous and sometimes even deadly species. Despite the number of studies carried out on this genus, the toxicity of some species, such as the group of white fungi, remains dubious. Hence Amanita ovoidea (Bull.) Link. is considered as edible and even tasty both popularly and in some scientific publications, and as poisonous in others, having caused various cases of poisoning. This study stems from a case of poisoning by A. ovoidea in Siena (Italy). Tests were performed with the aim of finding a scientific answer regarding the real edibility or inedibility of A. ovoidea. Analyses included phytochemical screening, toxicological tests on human ex vivo peripheral blood mononuclear cells, and measurements of soil and mushroom pollution by heavy metals. Fungi can represent a good natural source of nutrition, being rich in proteins and low in fat, contributing to vitamin and mineral intake, and providing dietary fiber. They are even used in medicines and dietary supplements. On the other hand wild edible mushrooms can be dangerous to consume because of toxins or heavy metal concentration. The incidence of mushroom poisoning varies greatly around the world, depending on local traditions, lifestyles, nutritional factors, climate and the occurrence of wild edible fungi   . Among the fungal toxins that cause organ damage in the human body, amatoxins and orellanine stand out. Many fungi containing amatoxins are found within the Amanitaceae family (genus Amanita). It is widely known that the genus Amanita includes various species: edible and inedible, dangerous and sometimes even deadly. Despite the number of studies carried out on the genus Amanita, the toxicity of some species, such as the group of white fungi, remains dubious. 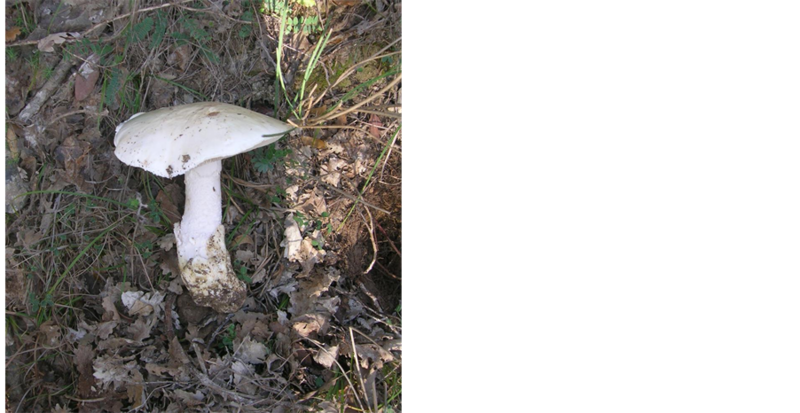 Recent publications concerning the toxicity of some species of the genus Amanita  - have boosted interest in Italy, where they are common and eaten in several different regions. Nowadays much attention is paid to Amanita ovoidea (Bull.) Link., which is described as both edible and edible with a good taste by popular and educational publications promoting its collection and consumption. On the other hand, this species has caused several cases of poisoning  . The organs targeted were intestinal mucosa, liver and kidneys. The poisonous species A. proxima is often mistaken for Amanita ovoidea due to its similar morphology and habitat. Moreover, some authors consider A. proxima to be a simple form or variety of A. ovoidea. Mushroom poisoning due to white Amanita is characterized by moderate gastrointestinal symptoms, followed by severe acute renal failure and sometimes by hepatic cytolysis. The onset of digestive symptoms occurs between 8 to 14 hours after consumption. This time lapse is considerably reduced (to a minimum of 30 minutes) when the carpophores are eaten raw, as frequently occurs with poorly cooked edible species of the Amanita genus  , proving the additional effect of thermolabile toxins. This study stems from a case of poisoning by Amanita ovoidea in Italy. The patient was hospitalized in Siena (Tuscany) in 2000 after having ingested A. ovoidea. The clinical data for this case were compared with those of another two patients hospitalized in 2012 after consuming A. proxima, in order to clarify the toxicity of the suspected species. In this paper we report the results of analyses performed with the aim of finding a scientific answer concerning the real edibility or inedibility of these species and clarifying the effective toxicity of A. ovoidea. The following experimental steps were carried out: phytochemical screening both to provide a more complete picture of the chemical composition of A. ovoidea and to confirm the presence of a non-protein amino acid, allenic norleucine; toxicological tests on human cell cultures to evaluate the amount of the alleged toxin in human blood lymphocytes and monocytes; analyses of soil and mushroom pollution by heavy metals, in order to observe their capacity for bioaccumulation and possibly relate the toxicity witnessed in this case to the presence of heavy metals. Samples of Amanita ovoidea (Bull.) Link. were collected in Autumn 2010 and 2012 both from the location in which the woman poisoned had found the fruiting bodies, at Cotorniano, Casole d’Elsa (province of Siena, Tuscany, Italy) (Figure 1) and from other areas. Some fruiting bodies of A. proxima and A. caesarea were also harvested. In some localities, soil samples were taken form the same place in which the species fructified (Table 1). Identification by means of macroscopic and microscopic specifications was performed with the usual morphological techniques and employing analytic keys and monographs. A stock sample of the species was also deposited at the Herbarium of Siena University (Italy). 2) In 100 ml of cold water at 20˚C for 7 days. The extract was then filtered through Whatman filter paper no. 4 (Munich, Germany) and adjusted to obtain a drug to extract ratio (DER) of 1:20. In this study we analyzed total polyphenolic and polysaccharide concentration (Folin-Ciocalteu method  and the phenol-sulfuric acid method  respectively), tannin occurrence (acid vanillin assay  ), cyanogenic glycosides (sodium picrate test  ), alkaloids (Dragendorff’s reagent and the picric acid test  ), amino acids (with TLC analysis and ninhydrin reaction), coumarins (with the KOH method  ), sterols and triterpene glycosides (Liebermann-Burchard test  ). Figure 1. Amanita ovoidea at Cotorniano the 21.10.12. Table 1. List of fruiting bodies tested by phytochemical screening and cell viability. Those tested for heavy metals are highlighted. 3) Pileus extract, volva extract, stipe extract (hot and cold water extraction): 1%. After incubation the cell viability was determined directly, using the Trypan blue dye exclusion technique. The cell death rate was determined by counting at least 300 cells in each observation. All tests were performed in triplicate. To further investigate the toxicity of the Amanita species, we subsequently repeated the cell viability test on A. ovoidea, as well as on A. proxima and A. caesarea samples (cold extraction of all parts of the fruiting body, DER 1:20, 1%) in order to have important control tests: the negative control was represented by the toxic A. proxima and the positive control by the edible A. caesarea. Statistical analyses were performed using the T-test and one-way analysis of variance, comparing the differently treated groups versus the control group. *(p < 0.05) and **(p < 0.01) indicate a significant difference compared with the control group. Soil samples were sorted manually and roots, stones, gravel and other external materials were removed. After drying at room temperature, they were kneaded and sieved with a 2 mm mesh. Mushroom samples were washed and placed in an ultrasonic cleaner for 30 minutes in order to remove the soil admixture and substrate. The samples were then rinsed with bi-distilled water and dried in a ventilated oven at 30˚C/40˚C, before being powdered. Chemical analyses of the dusts (0.2 g of soil dust and 0.5 g of mushroom dust) were carried out after digestion for 30 min in an ETHOS 900 Milestone microwave with a mixture of concentrated HF (60%), HNO3 (70%) and H2O2 (30%). The material obtained from this mineralization was diluted with bi-distilled water to yield samples of 100 mL derived from the soils and 50 mL from the mushrooms. The quantitative determination of heavy metals (mg/kg dry weight for V, Cr, Mn, Fe, Co, Ni, Cu, Zn, As, Cd, Sb, Cs, Hg, Tl, Pb and U) was carried out using inductively coupled plasma-mass spectrometry (ICP-MS, Perkin Elmer Sciex Elan 6100). The accuracy of heavy metal measurements in the soil was checked using the GBW 07603, National Standard Substance and standard reference materials. Table 2. Selected compounds in different parts of A. ovoidea (values are expressed as the mean of at least three determinations). The mortality of peripheral blood mononuclear cells (PBMC) in different parts of the fruiting bodies and under different extraction conditions and the results of the cell viability tests are shown in Table 3 and Table 4, respectively. 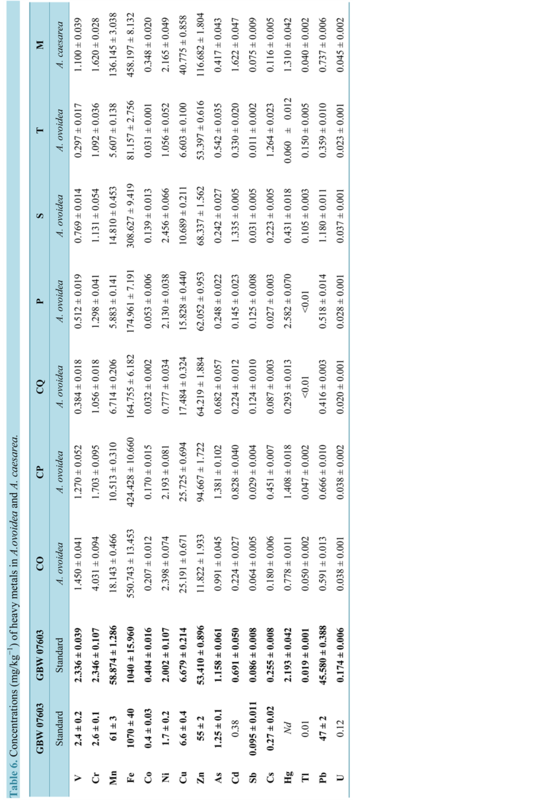 In relation to the control the mortality of PBMC was higher with A. ovoidea, going from 11.54%, detected by cold extraction of the stipe, to 45.03% in the pileus (Table 3). Cell viability was surprisingly over 50% in all three species tested: the dubious A. oivoidea, the poisonous A. proxima and the edible A. caesarea (Table 4). The heavy metal concentrations measured in National Standard Substance and standard reference materials were in good agreement with the values certified, with recoveries from 94% for Sb to 100% for Pb, as reported in Table 5 for the soil samples and Table 6 for the mushrooms. The precision level, evaluated as the repeatability of the analytical measures (n = 5) and expressed as the percentage of relative standard deviation (% RSD), was below 4.1% - 4.6% for all elements. The concentrations detected in the soil were within the natural range of soil variability (Table 5). This study also sought to assess the impact on public health of the presence of heavy metals in mushrooms consumed. The only exception was A. ovoidea “CO”, which was characterized by high quantities of Mn, Fe, Co, Sb, As, Zn, Tl and Pb (Table 6). Table 3. PBMC mortality with A. ovoidea. *p < 0.05 vs Control, **p < 0.01 vs Control. Table 4. Cell viability in Amanita species. Table 5. Concentrations (mg/kg−1) of heavy metals in soils under the mushrooms. Mushrooms belong to a group of organisms that differ greatly in morphology and evolution. Recent scientific and technological progress has increased knowledge about their cellular and biochemical characteristics, but people are unfortunately still dying from mushroom poisoning due to both insufficient knowledge of the species and erroneous popular beliefs still held, at least in some Italian families. The preliminary chemical analyses performed on Amanita ovoidea demonstrated that its contents in terms of compounds depend on the part of the mushroom considered. Our analyses demonstrate that the majority of metabolites occur in the cap and in the volva. This is probably related to fungal development and the occurrence of reproductive structures. There were no important differences between hot and cold extracts. Of particular interest were the results of the amino acid detection by the well-known reaction with ninhydrin. In fact the very low presence of amino acids leads to the assumption that poisoning by allenic norleucine can be excluded and that at least one non amino acid-related toxin is responsible; the high mortality rate of PBMC by cold extraction could be due to the thermolability of the toxins. In fact, according to some authors the toxicity of many species of the Amanita genus is greater when the mushrooms are poorly cooked or ingested raw  . The results of our cell viability analysis showed that all the Amanita species analyzed were toxic, even at the very low concentrations tested (corresponding to an average dose of 30 - 50 g of fresh mushrooms). This demonstrates that there is a different detoxification system in vivo, which plays an important role in distinguishing between edible and inedible mushrooms. For this reason we hypothesized that A. ovoidea is not normally toxic, but that it can be toxic under particular conditions or in certain persons, as can A. proxima. To support this hypothesis, we tried to identify any similarities between the people who suffered from mushroom poisoning in Tuscany, through an analysis of their clinical records. We discovered that all three were intolerant to alcohol. This condition is probably due to liver failure, which would explain why the mushrooms were poisonous for them. Mushrooms have long been known to accumulate high levels of heavy metals and can be used as bio-indicators of environmental contamination  . Several factors may affect the accumulation and concentration of trace elements and heavy metals in mushrooms. While concentrations of trace elements are generally assumed to be species-dependent, substrate composition is also considered to be an important factor: for this reason we evaluated the concentrations of trace elements in both the soil and mushrooms. Italy does not currently have specific regulations on heavy metals in wild mushrooms; in fact Regulation (EC) no. 1881/2006 of 19 December 2006 only gives the maximum limits permitted in cultivated mushrooms for Cd (0.2 mg/kg) and Pb (0.3 mg/kg). All our samples had values in excess of the maximum limit indicated by the EC Regulation. Comparing the heavy metal concentrations of A. ovoidea with those of A. caesarea, it transpired that the first species has a higher capacity for accumulation than the second; it also became evident that the accumulation of specific heavy metals could be species-specific and could thus take on a taxonomic role. Overall, our study showed that A. ovoidea, like the edible A. caesarea, can accumulate high amounts of heavy metals and could therefore be harmful to humans. The higher amount of heavy metals in A. ovoidea from Cotorniano, the location of the poisoning case, does not, however, seem to have been a causative factor. One of the main problems with poisoning around the world is the lack of awareness about toxin content in mushrooms. If the content of a mushroom is shown in detail, deadly mushroom poisoning can be prevented through early diagnosis and effective treatment  . Concerning Amanita ovoidea, although it is considered in many parts of the world to be edible, tasty, and even a healthy food due to its high levels of antioxidants and unsaturated fatty acids  , we suggest that it be consumed with great caution and cannot recommend its use. Finally, considering the many similarities in the morphology and habitat of the two taxa A. ovoidea and A. proxima, it was deemed important to perform molecular analyses in order to ascertain whether or not they differ at species level. While awaiting the results of this ongoing analysis, the collection and use of either taxa are not recommended. We would like to thank Emma Thorley of Language Box for language editing. Leray, H., Canaud, B., Andary, C., Klouche, K., Béraud, J.J. and Mion, C. (1994) Intoxication par Amanita proxima. Néphrologie, 15, 197-199. Ducros, J., Labastie, J. and Saingra, S. (1995) Una observation supplementaire d’intoxication par Amanita proxima a l’origine d’insuffisance renale aigue. Nephrologie, 16, 341. De Haro, L., Jouglard, J., Arditti, J. and David, J.M. (1998) Insuffisance renale aigue lors d’intoxication par Amanita proxima. Nephrologie, 19, 21-24. Bellù, F. (2009) Note di Micotossicologia. Bresandoliana, 1, 83-94. Biagi, M., Manca, D., Barlozzini, B., Miraldi, E. and Giachetti, D. (2013) Optimization of Extraction of Drugs Containing Polyphenols Using Estrattore Naviglio®. Journal of Agricoltural and Food Chemistry, in press. Guo, J.L., Chen, Y.J., Sun, G.Q., Guo, J.F., Wang, Y.H., Zhu, X.Q. and Nie, Q.S. (2008) Study on Phenol-Sulfuric Acid Method for Determination of Polysaccharide Content in Pleurotus eryngii. Food Science, 29, 555-558. Morelli, I. (1981) I principi attivi delle piante medicinali. Edizioni Edagricole, Bologna.